returns ready to rock in 20th Century Boys: Chapter 3 - Our Flag. The Skinny: We've reached the end of the 20th Century Boys film series! Was it worth the wait? Not really, but if you're a fan of the original manga it's a must-see anyway. Just keep those manga volumes handy in case you need to refer to them. by Kozo: Now that the 20th Century Boys films are done, one thing is certain: people are likely not going to associate this story with director Yukihiko Tsutsumi. The Sword of Alexander helmer has done a passable job of bringing Naoki Urasawa's sprawling sci-fi manga to the big screen, complete with numerous characters, multiple storylines and lingering, hard-to-completely grasp plot twists. The problem is that there's so much content in the original manga that making the film version anything but an exposition-filled droner would require a visionary filmmaker - and Tsutsumi isn't that. He's a competent director, but Urasawa's works need someone greater to adapt their dense, multi-layered narratives. The names of such filmmakers probably number less than ten. Picking up in the year 2015, 20th Century Boys - Chapter 3: Our Flag brings back the missing-in-action Kenji (Toshiaki Karasawa), who was presumed dead after the explosion on New Year's Eve 1999 wasted a huge chunk of Tokyo back in 20th Century Boys 1. Now a scruffy, wandering folk singer, Kenji travels back to Tokyo to confront the megalomaniacal "Friend", who has somehow progressed from cult leader to world leader – and in all that time, nobody has seemed to think it strange that he always wears a cloth mask with an eye + finger logo. Friend has duped the world into thinking he's some sort of savior, but before long he reveals that he's the mastermind behind most of mankind's recent ills - and his latest plan is sure to give humanity the proverbial black eye. Can Kenji and his now aged friends stop Friend before he screws with mankind again? If you've read Naoki Urasawa's original manga, you know the answer - well, at least part of it. As advertised pre-release, 20th Century Boys 3 features some changes to the manga's ending, and all things considered, they're good ones. The first change involves streamlining the true identity of Friend, reducing some of the confusion that occurred somewhere around volumes 19 or 20 of the manga. The second change allows the audience to actually see Friend when he was still a fairly innocent teen, and the moment actually brings a surprising poignancy to Urasawa's epic childhood-friendship-gone-wrong saga. If the 20th Century Boys movies have a payoff, it's that quiet moment, and not the action climax featuring a CG-rendered robot stalking all over Tokyo. Japanese cinema's love of maudlin emotion frequently crosses over into cheesy, but here it's handled well. Besides those changes, the filmmakers do throw a couple of new red herrings at the audience, adding some unexpected tension to a should-be expected storyline. 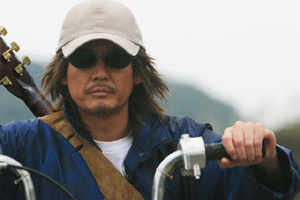 At certain key moments, 20th Century Boys 3 does capitalize on Urasawa's well-developed characters and situations, building interest towards the film's ultimate revelations. The problem: there are far too many interconnected characters and stories, making the film a long slog of expository dialogue and voiceover that will probably escape you unless you've studied Urasawa's original manga religiously. These films – all three of them – require a level of attention and investment that most casual moviegoers don't likely have. The mysteries and promised plot twists that seemed so exciting and relevant in the first 20th Century Boys film now carry reduced weight. Who is Friend? In the first film, his identity seemed vital, but by the end of the third film, that mystery has lost its urgency. When Friend's identity does finally come out, some people may even ask, "Who?"